Grab the forks, folks. This spring has ushered in the reign of the rhubarb. Long known in its most natural and popular incarnation, the strawberry-rhubarb pie, the tart and crisp perennial is popping up around the country—and not just during dessert. This month France got a taste during the Cannes film festival opening-night gala, where Spielberg, DiCaprio, et al. dined on sea bass with rhubarb prepared by Michelin-starred chef Anne-Sophie Pic. Those who just want to get drunk can have a seat at Jean-Georges Vongerichten’s just-opened ABC Cocina in New York City, which serves a rhubarb-banana daiquiri and a sparkling rose and rhubarb cocktail. And the swiftly growing People’s Pops, now opening its fifth storefront in New York, offers the refreshingly simple strawberry-rhubarb ice pop. The Chinese first used dried rhubarb roots medicinally 5,000 years ago for its helpful bowel-clearing properties. 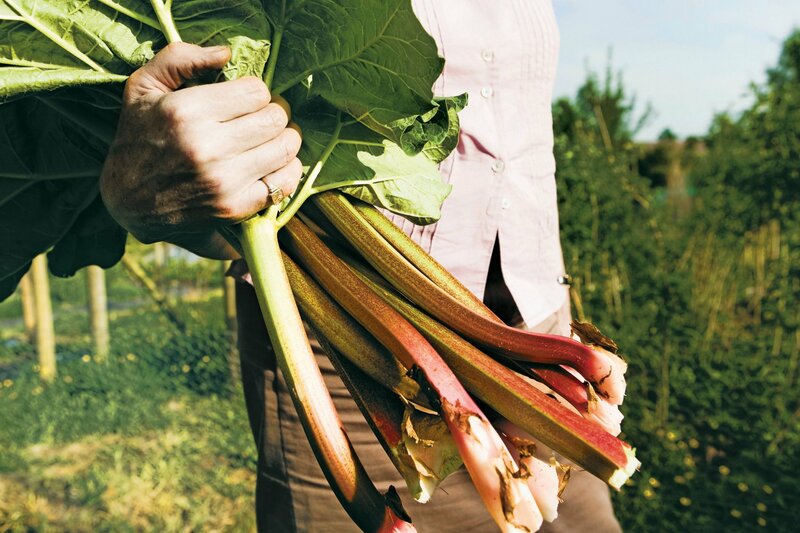 Despite its newfound ubiquity—call it the Ryan Seacrest of vegetables—rhubarb confounds many people, even those who grow it. “Thirty years ago, I couldn’t pick rhubarb out of a lineup,” says Dennis Duncan, who began experimenting with it after retiring from the corporate world 20 years ago, eventually founding the organic farm High Altitude Rhubarb in Black Forest, Colorado. With a long, thin stalk that’s red or green, depending on the variety, rhubarb is a strange little beast that’s hard to classify: horticulturally it’s defined as a vegetable, but culinarily it’s treated like a fruit. The Chinese first used dried rhubarb roots medicinally 5,000 years ago for its helpful bowel-clearing properties, but it wasn’t adopted into the mainstream until the early 1800s, after enterprising farmer Joseph Myatt of England pushed rhubarb onto the public and into Buckingham Palace by naming one still-popular variety Victoria, after the then–newly crowned queen. The United States caught on to his tricks soon afterward. There were millions of tons sold in the country until World War II, but after sugar rations began, the demand for rhubarb, which needs a pinch or two to cut its tartness, dropped precipitously. The market has never bounced back until, perhaps, now. At High Altitude Rhubarb, they’ve sold out of roots and plants for the year, with a waiting list started for next year. Duncan attributes the increase in sales to the fact that rhubarb sits at the nexus of the locavore, “buy fresh,” and organic movements. Of course, give anything one century (or 50), and what’s old is inevitably new again.